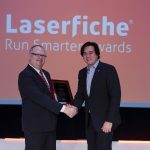 Last year, Laserfiche introduced a new Run Smarter® Award—the Tom Wayman Leadership Award—to honor an individual within the Laserfiche community who exemplifies extraordinary leadership, vision and commitment to sharing the Run Smarter® philosophy. 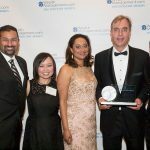 Barry Chapman, IT Director at Hanson McClain Advisors, a Sacramento-based investment advisory firm with over $2 billion in assets under management, has been named the second recipient of this prestigious award. Chapman has used Laserfiche to develop more than 80 workflows that automate everything from approval routing to new client onboarding. His most notable accomplishment is using Laserfiche as integrative middleware between the firm’s CRM, E-Signature application and forms filling software. With this integration, Chapman has been able to create a new account opening process that he hopes will save the firm more than 40,000 hours a year on document processing.